I have added some premium Italian leathers and hand made nine carat gold buckles to my range so I thought that I would highlight these here in case anyone thinks that my range never changes. Details of my full range of leathers can be found at Leather types and colours. Details of my hand made sterling silver and gold buckles, and how to order straps with these, can be found at Sterling silver and gold buckles. I am always searching for suitable leathers but I have had difficulty finding suitable leathers in the quality that I want and the thickness that I need for making straps the traditional way. After a lot of searching I found these beautiful Italian leathers which are superb quality and colours. They are not available from any British supplier so I import them myself. I have two colours available, brandy and dark chestnut. The brandy is the lighter of the two. This photograph shows Type B and Type A straps in brandy and dark chestnut, both with my hand made sterling silver buckles, with the background samples of the hides, to give you a different view of the two colours. 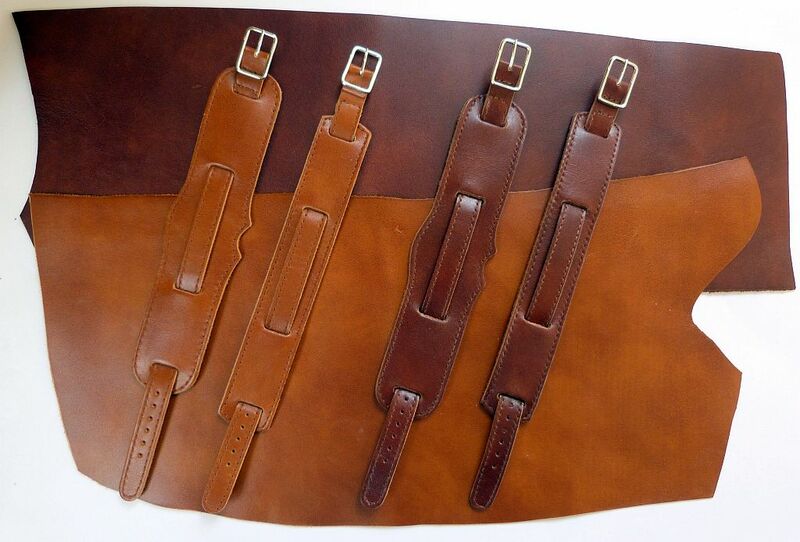 All the straps in the picture are made with stitching that closely matches the colour of the leather. Contrast stitching can be done to special order, and the brandy looks particularly good with black stitching, which I think gives a real smart and sophisticated look. The colour can vary across each hide, and it is always difficult to get a good colour representation on a computer monitor, but these are high quality leathers with beautiful rich colours. These are premium leathers, the best I have ever seen, butter soft and lovely to feel. They are much more expensive than the standard leathers so I have to charge an extra £2.00 for straps made from these premium Italian leathers. There are pictures of customers watches on straps made in these leathers on the customers page. I keep some straps made up in these Italian leathers with standard buckles, which you can order at Ordering straps with standard buckles. I also keep some straps made up in these Italian leathers with sterling silver buckles, which you can order at Sterling silver and gold buckles. 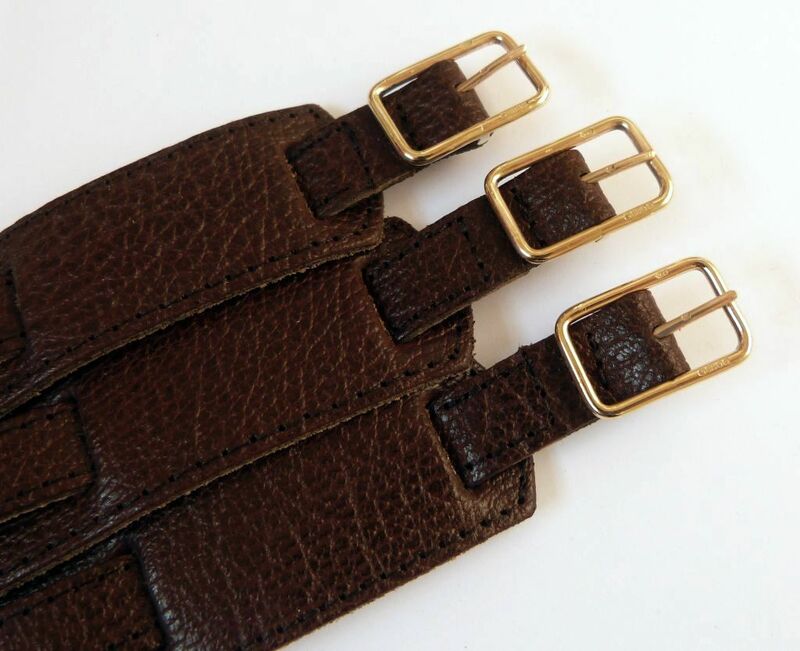 If you want to order one of my designs of straps in these Italian leathers with a 12mm nine carat gold buckle, please email me with the details and where you live (just the country, for the postage) and I will send you a PayPal invoice to place the order. I have made some of my Type GW buckles in nine carat gold, the picture here shows one of them. They are the same design as my Type GW sterling silver buckles and are hallmarked at the London Assay Office with a full set of traditional hallmarks, including the sign of a crown for gold instead of the lion of sterling silver. I intend to keep in stock nine carat gold buckles in 12mm width, i.e. to fit 12mm straps. 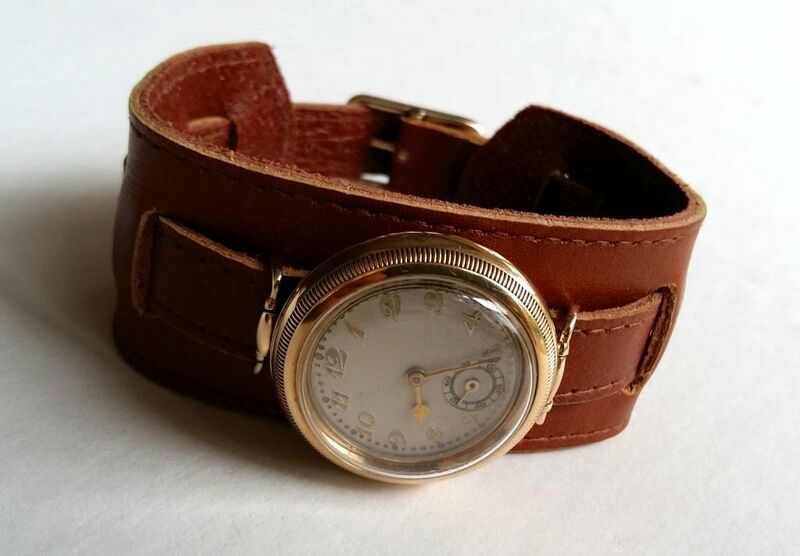 Any of my vintage watchstrap designs can be made up in any of the leather types and colours that I carry. If you want to order one of my designs of straps with a gold buckle, please email me with the details and where you live (just the country, for the postage) and I will send you a PayPal invoice to place the order. Original gold buckles that I have seen have always been small in both overall size and wire diameter compared to my Type GW design. I think this was done to keep the cost down but they look a bit wimpy on a man's strap. I prefer my Type GW design made in 2.0mm wire as shown here, which makes the buckle about four times the weight of an original and increases the cost of the gold proportionately. But I always think that if you are going to bother doing something, you might as well do it right. One of my designs of strap with one of my hand made, London hallmarked, 12mm Type GW nine carat gold buckles is £120 plus p&p. Other sizes can be made to order but this involves extra cost and time for hallmarking, which can take a long time. See the main page about gold and silver buckles for more details. Because of the high cost of gold bullion compared to silver (about 25 times as much) I do not always have gold buckles in stock. If you are interested, send me an email. The first three gold buckles that I made were for a Danish collector. They are shown in the photograph here on straps made up in dark brown Montana grain leather. 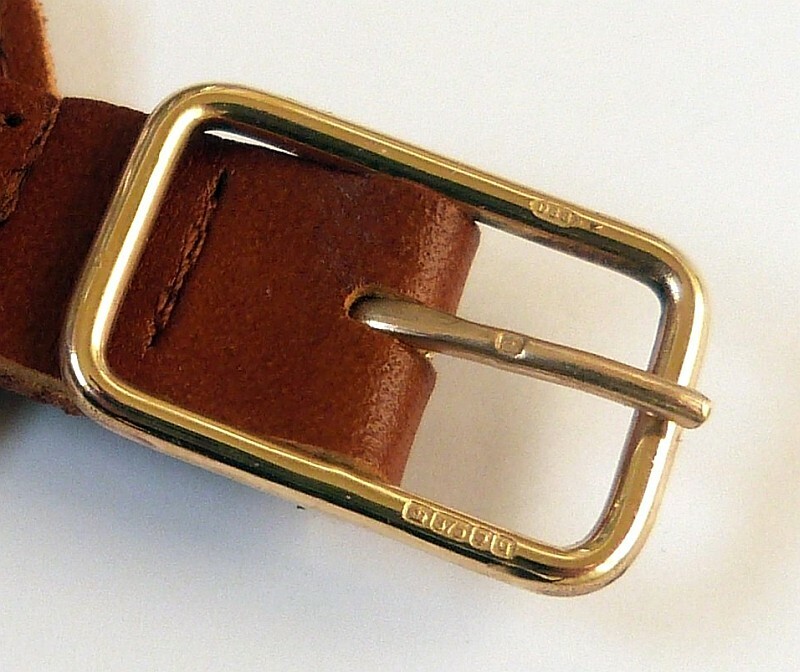 The second customer for one of my hand made and London hallmarked gold buckles was a collector in the Netherlands. He wanted a strap with a gold buckle to go with his gold Angora Watch Company wristwatch with hermetic case made by Borgel. Do I think the strap is beautifull? I think it is magnificent!!! If you want to order one of my designs of straps with a gold buckle, please email me with the details and where you live (just the country, for the postage) and I will send you a PayPal invoice to place the order.